Home » News » We have a bug in the shop! We are doing a face lift on a Dune Buggy. 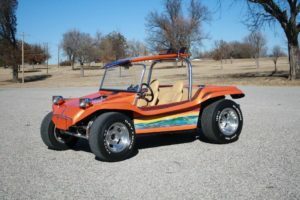 The dune buggy industry started back in the 60’s. It seems here lately that the Dune Buggy is making a comeback. With more and more baby-boomers retiring, many who remember the dune buggies and the surfing scene are dusting off their projects and bring them back to life. Facebook sites are popping up and more and more are seen on the roads. If you need help with your project we can help you out. ← Truck Night is still on tonight!